The Monroe County soccer showdown between Gibault and Columbia for the sectional title went as advertised Saturday on the turf at Belleville West, with a goal in the final minutes deciding the outcome. In the end, the Hawks prevailed on a goal by senior scoring leader Logan Doerr, 2-1 over the Eagles. 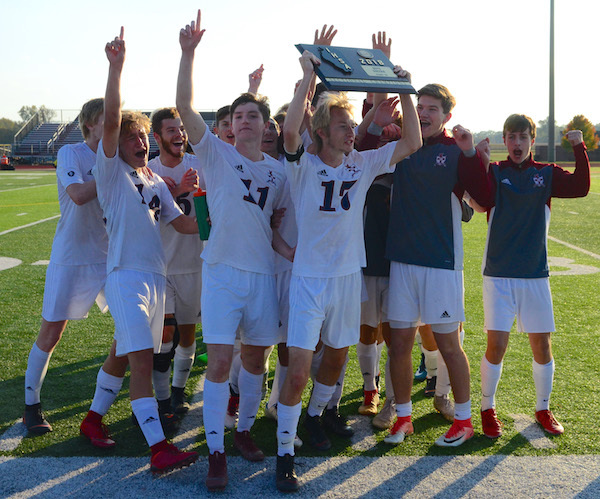 Gibault (16-4-5) advances to the Class 2A Chatham-Glenwood Supersectional, where it will play Springfield at 6 p.m. Columbia ends its season at 21-4-3. The game was scoreless at halftime in a physical but cleanly played match, with both teams waiting to pounce on a mistake. “In the early going, it was a lot of both teams feeling each other out,” Gibault head coach Darryn Haudrich assessed. This was the third time this season that Gibault and Columbia had met on the soccer pitch. Cam Kincheloe opened scoring for the Hawks about four minutes into the second half, kicking in the rebound off a long shot that deflected off Columbia goalie Alec Venhaus for a 1-0 lead. The Eagles dug deep and amped up their play from there, resulting in several scoring chances. Columbia finally evened things up on a stunning goal by Alex Barton at the 55-minute mark. Columbia continued to mount pressure, but Gibault’s backline was able to turn the Eagles away. Then with two minutes remaining, Doerr’s tenacity paid off with the game winner. “We caught a late one there,” Haudrich said. Doerr beat his defender and his initial shot led to a scrum in front of the net. Doerr eventually found a way to poke in his own rebound for the Hawks. Doerr leads the team with 21 goals on the season. Gibault placed third at the Class 1A state tourney in 2016 and lost in the Class 2A state title game last season. The Hawks are one win away from a third straight state tournament appearance.